Carm began his career with Northwestrern Mutual through their award-winning internship program. Carm then went on to spend two years at JP Morgan Chase and two years at BMO Harris advising clients on their wealth management needs. Before starting his practice, Carm considered various firms with whom he could forge a long-term relationship. Northwestern Mutual's mastery of risk management, wealth accumulation and financial planning made it the obvious choice. Further, Carm stated, "I am confident that we do the right thing for our clients, so I looked for a company with a longstanding history of doing the same. " In 2012, Carm was honored to be a featured speaker at the Northwestern Mutual Annual Meeting in Milwaukee, Wisconsin. Carm and his team are proud to have received the NAIFA Quality Award in 2013-2018. Carm has also been a qualifying member of the Million Dollar Round table in 2013-2017. In January of 2014, Carm was appointed Managing Director for his Downers Grove office and oversees a team of reps, as well as mentoring the Summer interns. Carm Barbaro is a member of the National Association of Insurance and Financial Advisors (NAIFA). The mission of the National Association of Insurance and Financial Advisors is to advocate for a positive legislative and regulatory environment, enhance business and professional skills, and promote the ethical conduct of our members. National Association of Insurance and Financial Advisors Quality Award 2013, 2014, 2015, 2016 and 2017. This award recognizes agents whose practices have demonstrated competence and dedication to the insurance industry and their clients. Agents who receive this award have tangible evidence signifying that the products they sell will meet clients' needs. Carm was publicly recognized for this achievement on February 17th 2018. MDRT membership represents the top 1% of all financial advisors worldwide. MDRT provides its members with resources to improve their technical knowledge, sales and client service while maintaining a culture of high ethical standards. Its mission is to be a valued, member-driven international network of leading insurance and investment financial services professionals who serve their clients by exemplary performance and the highest standards of ethics, knowledge, service and productivity. 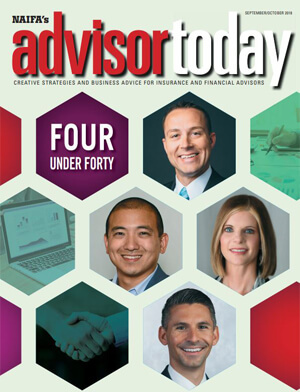 In 2018, Carm was named as a Top Four Advisor Under 40 in the nation. Recipients of this award are recognized for excellence not only in their personal advisory practices, but also for their commitment to their communities, families, teams and peers. Click here to read the Chicago Tribune article on this acheivement. Carm holds his Bachelor of Arts in Corporate Communication from Northern Illinois University.